﻿ Lost Beers - What was a 19th century saison really like? Home » What was a 19th century saison really like? What was a 19th century saison really like? Lately, I’ve taken on a daunting task: to seek out the history of all the different beer styles of Belgium. When did they first appear, what were they like throughout the years, and in many cases: when did they disappear? In fact, of the many beer styles Belgium knew in the 19th century, only a few survived: white beer, lambic and its derivatives gueuze, faro and kriek, Flemish old brown, and saison. Others, like the Peeterman of Leuven, the drijdraad from the Land of Waas and the grisette of Hainaut, have all died out. My method may be unorthodox, or at least by Belgian standards. I typically like to ignore whatever the brewers themselves may today be saying about the history of a certain beer, and instead I look at historical sources: old brewing logs, literature, advertisements, statistics, complemented by more recent literature if it’s well-documented. One important beer type is especially problematic: saison. If right now I would have to write a short history of saison with the information I have found so far, it would look completely different from the narrative you usually hear. That narrative usually goes something like this: saison is typical for the Belgian province of Hainaut and was brewed on farms in winter time, when the farmers had nothing else to do, and that saison was drunk by farm workers in summer. And thus, saison is supposed to be a ‘farmhouse ale’. My findings are different. This may shock saison lovers, but there is no historical text describing saison as a typically rural beer or specifically aimed at farm workers. 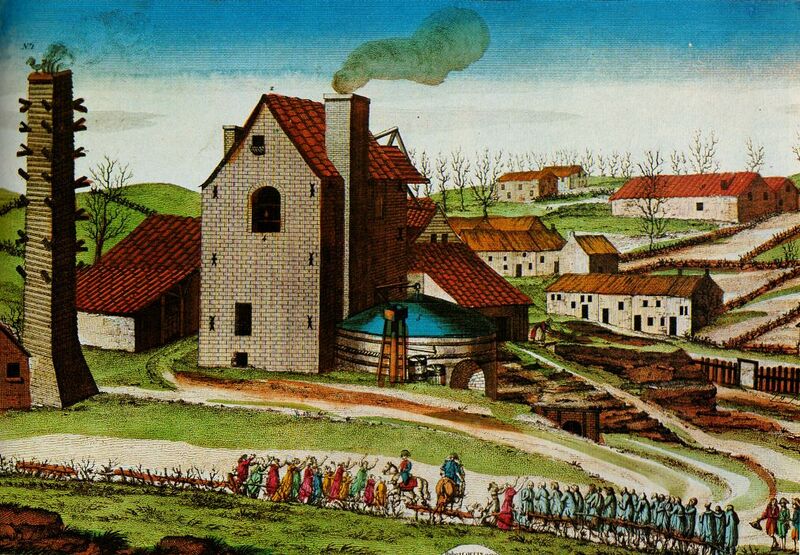 Instead, the oldest mention of saison that I found dates from 1823, where it is described as ‘Advent or March beer, excellent beer that is brewed in Liège and that can be kept.’ Liège, for those who do not know it, is a typical industrial city with coal mines and metal industry, and this was already the case in the early 19th century. Hardly a rural environment, you would say. Also, it is not in the province of Hainaut. It is the saison of Liège that is described in various 19th century brewing manuals, and it was markedly different from the Hainaut saison of today. It contained mainly malted spelt and unmalted wheat, and because of its low attenuation it was relatively sweet. It was brewed in winter time and drunk after 4 to 6 months. By 1862, there was also a double version and I even found a few rare instances of a ‘triple saison’. A few elements of this Liège version sound familiar: it was brewed in winter (the ‘season’ the beer was named after) and drunk a few months later. But there’s nothing to suggest an agricultural environment. 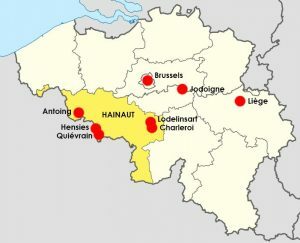 So what about saison in Hainaut? It is hard, very hard to find 19th century evidence of saison being a regularly brewed beer type there. 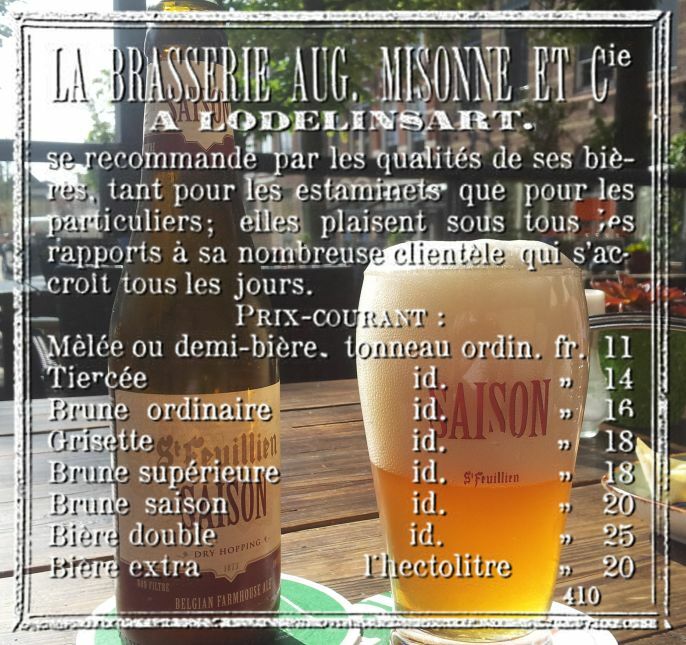 The earliest mention of saison in that province is in Charleroi, in 1858 where a pub called Le Petit Caporal promised two litres of ‘bière de saison’ to anyone who would reach a ‘nine four’ in a bowling game. Three years later, Charleroi-based singer Jacques Bertrand sang about saison in this way: ‘Brewed in March, this clear beer, quenches us during summer days’. Surely, this at least sounds like today’s saison, but maybe I need to remind you that Charleroi, too, was a very industrial coal mining city. 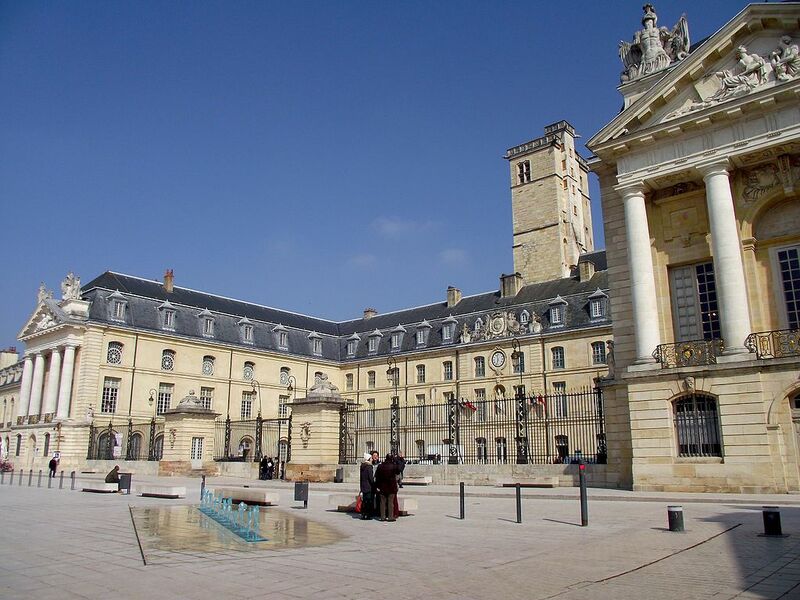 City hall of Dijon, France, where the 1866 international hops fair was held. Two rather odd Hainaut saisons were present. Source: Wikipedia, photo by Parsifall. As I said, sources for 19th century Hainaut saison are sparse. Instead, other beers were seen as typical for Hainaut or for Wallonia in general: the grisette for instance, a light-coloured beer with some wheat in it. It originally came from a town called Antoing near Tournai, but that later spread as far as Brussels and Jodoigne in Brabant. Another one was simply called ‘brune’ or brown beer, either made from barley or a variety of other grains. While this could be made as a keeping beer, it wasn’t specifically known as a saison. In fact, most 19th century mentions of a saison in Hainaut seem to use the term not as an indication of a beer type (as was the case in Liège), but more like an additional description of another beer. For instance, at the international hops fair in Dijon in October 1866 (when Burgundy was still an important hops growing region) the Bataille-Lenglet brewery of Quiévrain presented its ‘grisette de saison’, made in November the year before; at the same fair, Robillard from Hensies presented various forms of ‘bière brune vieille’ (‘old brown beer’), among which a ‘brune vieille de saison’, ditto ‘demi-saison’ and even one ditto ‘genre Lambic’. Both breweries were from Hainaut. 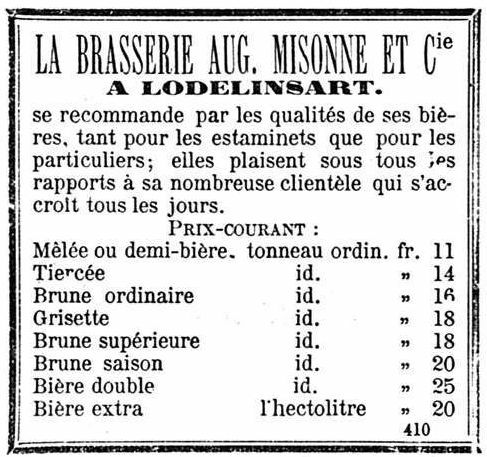 Likewise, in 1883 the Misonne brewery from Lodelinsart, an industrial suburb of Charleroi, advertised grisette but also ‘brune ordinaire’, ‘brune supérieure’ and ‘brune saison’. An add showing a ‘brown saison’. Gazette de Charleroi 4-1-1883. In contexts like these, the suffix ‘de saison’ apparently simply meant ‘a version of the usual fresh beer, brewed in winter for keeping for half a year or so’. In this way, it was considered more or less a synonym of other terms for keeping beers: ‘bière de garde’, ‘bière de provision’, bière de conserve’, ‘vieille bière ‘… Some writers saw some kind of difference in how these keeping beers were made, others seem to use the terms without distinction. In a way, even the Liège saison originally was simply the keeping version of the fresh spelt beer that was already made there in the 17th century. It seems that only by the late 19th century, Hainaut breweries started to sell ‘bière de saison’ as a standalone beer, although even then sometimes the words ‘bière de garde’ were added to make clear what beer they were talking about. So, what to make of this? For one thing, it is clear to me that the history of saison is way more than simply ‘it was made on the farm’. I doubt the earliest saison found in Liège was a farm beer (or a ‘farmhouse ale’, if you will). I doubt the earliest saison found in Charleroi was a farm beer. I doubt a simple farmer would have sent his simple homebrew all the way to Dijon to be judged by a professional jury, as was the case with the two early Hainaut saisons in 1866. For one thing, the 19th century saison that we know of was made by professional brewers. So what about the ‘farmhouse ale’ story? Surely, many Belgian breweries started out as farms (Duvel, Bosteels, Palm…), but why is saison supposed to be the typical farm beer? I’ll look at that more closely in an upcoming article. Grisette survived as a brand name owned by the Saint-Feuillien brewery. For instance, excellent research on Belgian beer history has been done by people like Raymond van Uytven, Erik Aerts, Frank Becuwe, Chris Vandewalle, Yvan Derycke, Paul Daeleman, Raf Meert, Dave Janssen and many others. Cf. Phil Markowski, Farmhouse ales. Culture and craftmanship in the Belgian tradition, Boulder (Colorado), 2004. In chapter six, Yvan de Baets describes this version of saison history in more detail. I’ll give a critical appraisal of this article in an upcoming article. L. Remacle, Dictionnaire wallon et Français, dans lequel on trouve la correction de nos idiotismes, par la traduction en français, Liège 1823, p. 309. Georges Lacambre, Traité complet de la fabrication de bières et de la distillation des grains, pommes de terre, vins, betteraves, mélasses, etc., Brussels 1851, p. 376-378; La Meuse 15-3-1862, 5-7-1886. Charles Le Cocq, Coup d’Oeil sur la statistique commerciale de la ville de Tournay et de son arrondissement, Tournai 1817, p. 65-67; Le peuple 25-2-1894; Jean Palange, La brasserie Palange ou l’histoire d’une entreprise familiale Jodoignoise, Jodoigne 1988, p. 45-48. Le Cocq, Coup d’Oeil p. 65-67; Jean Baptiste Vrancken, ‘Antwoord op vraag 81’, in: Nieuwe verhandelingen van het Bataafsch Genootschap der Proefondervindelijke Wijsbegeerte te Rotterdam, Rotterdam 1829, p. 239-245; Lacambre, Traité complet, p. 320-321. Comité central d’agriculture de la Côte-d’Or, Concours international de houblons et de bières. 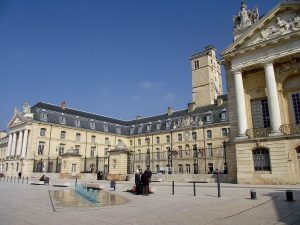 Dijon Octobre 1866. Catalogue et list des récompenses, Dijon 1866, p. 37, 39. A. Laurent, Dictionnaire de la brasserie, Brussels 1875, p. 75, 139, 273. Cf. 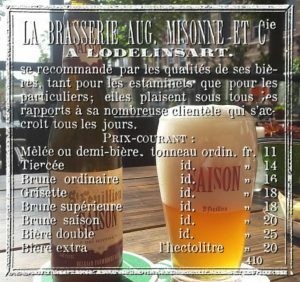 http://www.horscategoriebrewing.com/2018/01/biere-de-saison-1905-recipe-infusion.html. Joseph Kinable, ‘Glossaire technologique wallon-français du métier des brasseurs’, in: Bulletin de la Société Liégeoise de littérature wallonne, second series part 13 (1889), p. 293-319, here p. 310. 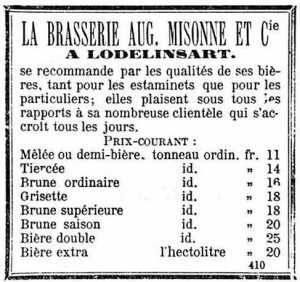 Gazette de Charleroi 9-5-1904; http://www.horscategoriebrewing.com/2018/01/biere-de-saison-1905-recipe-infusion.html. Serving keeping beer to farm workers in the field seems unlikely too. Surely you’d want something weak in that situation? Good work Roel. I’m on Twitter but not on Facebook, for you it is the reverse, I understand, so some comments here. La Cambre, whom you cite, states of Liege beer that it is made in Liege “et ses environs”, so he doesn’t limit it to town production. Regarding mash bill, he says spelt is generally used for the aged version, likely malted as you said, with a mixed grain bill typically for the young one. It’s a magazine article in English in the mid-century. The article states also that barley beer was the main type in Charleroi (in Hainaut), so Saison Dupont seems traditional in that sense as Jackson has written it is all- barley malt. La Cambre states that Charleroi beer generally did not keep well, suggesting saison was not a practice there, yet he still advises to age it 4-5 months, suggesting too it benefits from age. I’d infer in time the Charleroi and Mons brewers did just that and Dupont is a modern example. The brown saison you mentioned was probably very long boiled, aged beer as La Cambre says the longer the boil the better it keeps (and of course the darker the colour). My view is, saison simply meant keeping beer as it did in many countries including England. It wasn’t a fixed recipe in Belgium or even Liege or any part of Hainaut, in all likelihood. Jackson called Dupont a “farmhouse brewery” and may have assumed that Dupont’s (presumed) origin as a farm defined the style and people who drank it, but as you said that seems not the case. On the other hand, while farmhouse doesn’t define the beer type, it wasn’t limited in my view to an urban or town origin due, I think, first to what La Cambre wrote about “ses environs”, and second to the survival of Dupont and other saison producers Jackson thought were farmhouse in origin based on what the owners must have told him. In other words, while I agree with your main point, I don’t believe saison originated solely in cities. I think a prosperous farm with the money to buy brewing equipment and hire workers must have produced the beer as well, at least La Cambre suggests this and his account of the Liege practice is fairly detailed as you know. Saison seems to have been the boon companion to the young beer. Farms needed young beer for year-long consumption. Some must have made a version apt for aging into the summer, imo. But once again, I take your main point, that farmhouse production likely did not define its origins and classic consumption pattern. Thanks for your hard work tracking down historical information. It’s good to see the myth separated from the facts for Belgian beers, as Ron Pattinson and Martyn Cornell are doing for British beers. I really love this information you share Roel. It helps me a lot to better understand beer styles and traditions, and get inspiration for my own brewing. Greetings from Chile. Cheers! Very interesting post, and well documented. Bravo! Some thoughts, though. As a general rule, where people grew grain, they also made beer from it. Simply because once you have the grain, all you need is work. So unless there was a legal ban or heavy taxation on brewing in the area it would be very surprising if the farms didn’t brew. Whether this was the case or not, I don’t know. Harvest ale was a tradition basically over all of Europe, because the harvest workers needed liquids and calories, and beer gave them both. There were two kinds: weak ale for drinking while working, and strong ale for celebration in the evening. The weak kind was the most common. There was a tradition for farms brewing strong beer in spring and drinking it in the autumn in both Denmark and Westphalia, at least. I know this is circumstantial, but by analogy with nearby regions you’d expect Belgium to have a farmhouse tradition of brewing harvest ale, and it wouldn’t be at all surprising for this to be a strong beer brewed in spring and then cellared. Whether what’s brewed under the name of saison today has any relation with that hypothetical beer is another matter. The use of very warm-fermenting (up to 36C) multi-strain yeast fits like hand in glove with farmhouse brewing in the rest of Europe. So on the face of it the story sounds plausible. Also, you don’t need 19th century documentation of commercial saison brewing to prove the now accepted saison story. It could have been brewed on the farms until surprisingly late, and consequently also become commercialized late. Farmhouse brewing is still alive in Denmark today, and it was still alive in Westphalia in 1956. Farmhouse brewing developed into commercial brewing many, many times over the course of history, and it wouldn’t be at all surprising if that’s what happened with saison, too. If there really was a farmhouse brewing tradition in this area (and there very likely was) the place to look for it would be in ethnographic literature, agricultural histories, local folk museums, and that kind of place. Brewing manuals and beer literature tends to completely omit farmhouse brewing, even if it’s taking place right outside the breweries they write about. I don’t know much about saison, but in my eyes, none of what you write here is very conclusive one way or another. I really look forward to the next post, though. Always exciting to see more evidence. The reference to Charleroi that I meant is in Lacambre’s discussion of saison, indeed it’s under Liege beer there, he only uses the term saison for Liege, as did the magazine piece. Still, he advises to age Charleroi beer for longer than the usual running period so to speak. Also, did I mention that in Jackson’s Belgian beer book (Great Beers of Belgium), I have the first ed., he states that saison is typical of Hainault but is also known outside that area too (plus there is that Flemish “seozen” variant as you know), so it seems he does acknowledge a link beyond the Hainault region. Sorry Roel, I meant that the Charleroi discussion by Lacambre is in his brewing book, near the Liege discussion of course (same country), but separate. He only mentions saison under Liege.